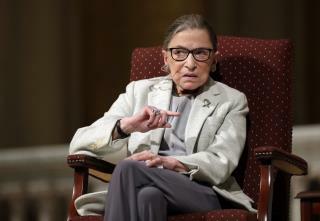 (Newser) – Even if there were an equal number of male and female justices on the Supreme Court, a new study suggests the sexes wouldn't have an equal voice. Researchers at the Northwestern Pritzker School of Law say female justices simply "do not have an equal opportunity to be heard" as they've been interrupted three times more often than male justices over the last 12 years, despite speaking less often. During the 2015 term, a female justice interrupted a male colleague seven times at most, per SCOTUSblog. But female justices were interrupted up to 15 times by a single male colleague. Justice Sonia Sotomayor was interrupted 15 times by Justice Anthony Kennedy, 14 times by Justice Samuel Alito, and 12 times by Chief Justice John Roberts, the study says. Of course men of SCOTUS interrupt the women justices more, one of them is always asleep!! Perhaps they were TRYING to point out to Justice Sonia Sotomayor that she had her facts wrong and didn't want to waste their time listening to garbage. Libs do tend to ignore the facts when they engage their mouths. It doesn't necessarily mean intentional gender rudeness as opposed to women not speaking up more often. As the article suggests, as women recognize asking questions to get at the points being considered, the interruptions should equal out. From birth to maturity, women in practically all professions digest info rather than gaining info.